It’s part of Siemens’ philosophy that networked and well channeled mobility combined with safe and fast public transport will become a major issue in the 21st century. In effect, Siemens and Designworks USA are working together to lessen the world’s dependence on the automobile (but there will always be a pent-up demand for BMWs). Besides having to be stunning, the Metro Inspiro also needs to be functional for subway riders in the future. 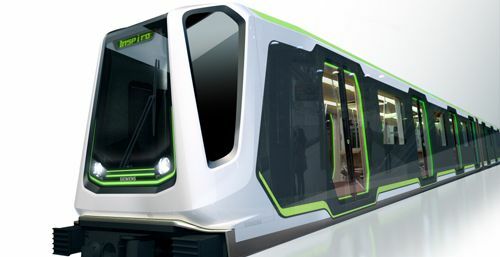 It is designed to improve how quickly passengers can get on and off to increase the number of runs the subway can make – thus moving even more passengers. Keeping with the need for personal space, the Metro Inspiro offers future subway riders a hand rail called the “light tree” that has a number of small protruding rails to give more places to grasp during transit. These light trees are also going to be used for ambient lighting that adapts to the time of day. The Metro Inspiro will have wide entry and exit areas, wide doors, improved acoustics through the use of Cork Blend floor insulation and a sophisticated lightweight seat concept. This subway of the future is envisioned as a means for making urban areas more attractive to live in. A growing number of people around the world are choosing the urban lifestyle and this improved subway of the future is seen as one way to make urban living more desirable.